Here is a list of all the postings Don Fry has made in our forums. Click on a thread name to jump to the thread. On the seventh time of asking, a Hobbyking Yak 55M got launched. Laser 80 shoehorned in. The seven attempts were caused by problems with the chicken hopper tank system, a defective main needle O ring, defective plug (only been in 5 years), and me forgetting to bring the canopy. Anyway, it's done. Nice flier, docile enough with care, benign stall, very agile. I was nervous about this one as the advised control throws were abviosly fiction. Half the advised throws give lunatic mode. And a 540° stall turn. Having looked at a photo of one of these, the rigging is non functional, so dressmakers cotton sheathed elastic will do for the "wire". I can't think of much commercial stuff available, except some of the fittings used for "closed loop" or "pull pull" control systems. Be easier to make your own, as a small model like that will not be happy straddled with a load of heavy units designed for load bearing in much heavier aircraft. I think, Timo they also offer a German language version. I took the test early, no language option, so French it was. When I looked, when the option was available, the foreign language versions were very high quality, idiomatic use of language. The online test is available in an English language version. Arrrrrrrrrr Peter, but you quite rightly say your NiXxx cell is close to voltage. There are some who do right voltage. Hence a dropping resistance. Your Nixx cell is good (ish), if fully charged, for plugs designed for zinc carbon cells. But weedy for plugs designed for a single lead acid cell. And possibly ideal for modern fusion plugs, as modern cooks say. We are blessed by tolerant motors. But one size does not fit all. 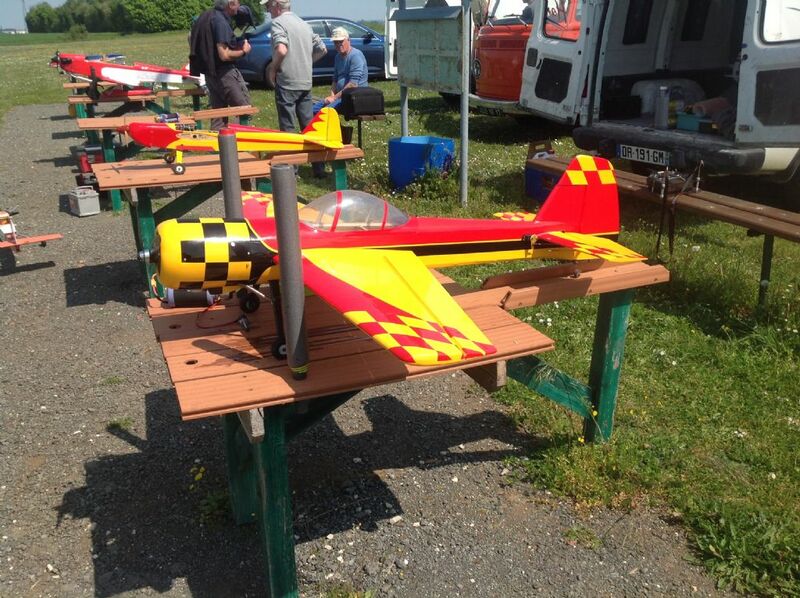 I have a ARTF Yak 55, with a laser 80 shoehorned in. On the seventh ( I think) visit to the field, the thing finally (I think) has a reliable chicken hopper tank system, a main needle with good O rings, a new plug, and all problems sorted. Next time, it gets off the ground. On very low rates. What can go wrong. Good unit and set up for life. Use a bit less power on the launch. It's not a power model. Percy is right. Once you have some hight, open it up, pull the stick back, and point it at the moon. I've got another version of these things, stock power system, and full power, it will hit the ground, before you can pull it up. At half throttle it's docile. Its a glider. It's behaviour on power is not its thing. That doesn't appear to have stopped Bedfordshire Police prosecuting at 31 mph on their cameras unless they fibbed to the local press. I don't know about other systems but I could easily falsify the date and time of a flight and I don't think there would be any data trail to prove that I'd done it, so a decent prosecuting lawyer should be able to get such evidence disallowed in court unless there was no opportunity to "create" it. Has a speedo been used, coroberation with an operator, in court. Answer, fairly common. Witness in a case of say, reckless driving says " in my estimation he was doing 80, speed limit 30" is not evidentially sound. No corroboration. Two people say it, sound, corroborated. Or a driver saying it, with backup from the speedo. Or indeed, a copper, driving a police car with an uncallibrated speedo ( many have calibrated units mind), saying that's the speed I followed him at, and the speedo agreed. The police forces do not enforce with no latitude. They knock 10% off, as a car speedo is allowed to be up to 10 % out. At one time they would knock another 10% off for luck, to avoid argument. That is optional. But back to post, David has his data, he is good, but the air proximity incident is running, and the other party says David was at 900 feet. After all, the truth is an early casualty once an investigation starts. The other party's wailed, honest governor, I look at me altimeter, on me grannies life, I look at it every 5 seconds, will struggle against time framed, recorded data. And calibrated or not, it can be checked for accuracy and reliability. Getting a bit deep now! I doubt that information obtained from an uncalibrated hobby device would stand up in a court of law but its use could well be seen as an attempt to act with reasonable care should an incident occur. That's a lot of servos. I'd have a good look at the 3 extensive damaged ones. Do you really want them? Is the only reason they still exist because you can repair them, but can't actually be bothered. If you broke them up, they would cease to bother your Khama, and your mind can return to important stuff. End of day, blessed with the ability to build, why value the wrecks. I have bodged to straight as follows. Please sit before reading. Build a frame, adjustable, so a crosspiece can be screwed/clamped to the back face if the fuselage, adjust so it's now bent the fuselage in the opposite direction the the twist, at least as far as your twist is out. Now see if you can see what looks out of line, and crack those joints. If you can't see what is out of line, crack some joints, and reglue. Ease the cross piece and see see if you are straighter, replace the crosspiece to its opposite twist position, and crack another joint or two, repeat untill straight. This is a construction secret. Tell no one. Tuffcote was I believe a product in the family, acid catalysed lacquer. Used in the furniture industry to provide tough surface finishes. I have just Googled "acid catalysed lacquer" and get plenty of hits. My mates and I have a saying and that is when I die, do not let my wife sell the stuff for what I said I paid for it! Probably what you will get. I noticed on E Bay yesterday, a very nice looking current production model, OS120 Surpass pump, yours, 100 quid inc delivery. That is 25% of what someone paid, and I bet it would see me out.